Going to A. S. Colyar’s room in Williams House No. 2, on Forsyth street, Wednesday afternoon to make efforts to get information of alleged grafting on the part of Chief of Police Beavers and Chief Lanford, Mayor James G. Woodward walked into as neat a trap as was ever devised. The same dictagraph which was alleged to take down the statements of Colonel T. B. Felder, is said to have been working while the mayor of Atlanta was in conference with E. O. Miles, a private detective; Febuary, Chief of detectives Lanford’s clerk, and A. S. Colyar. The mayor admits frankly he was there, but says he offered no money, but that he would subscribe to a fund to unearth graft in any city department; and also said that his visit had nothing whatever to do with the Phagan case. “These parties told me they had evidence of the corruptness of Beavers and Lanford. I wanted to see what they had,” he is quoted as saying. Part of the conversation, as alleged to have been taken down by George M. Gentry, nephew of the president of Southern Bell Telephone company, dealt with the early arrival of Miles, who discussed the Phagan case with Colyar. After Mayor Woodward arrived in the room, Colyar stated that Febuary had the goods on certain members of the police and detective department. There was some discussion about the right of the police to arrest anyone who could get such evidence. Mayor Woodward staying that he didn’t understand how such an informer could be thrown in jail. At some of the most important portions of the dictograph record Mr. Gentry reported that there was much confusion outside, or the speakers spoke so low, that he could not gather what was said. 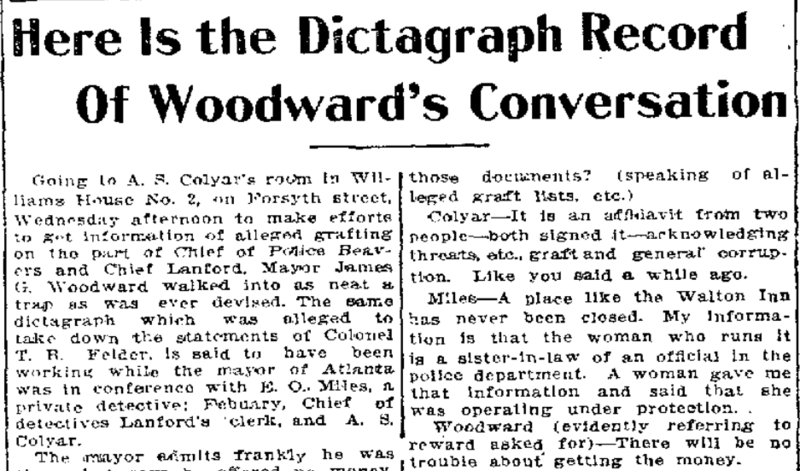 A little later on in the record Woodward assured Colyar that there was nothing for an informer to fear. “You don’t know what police persecution is,” Colyar said. “They can prove that black is white, and water will run up stream, and they can get a jury that will——“ and here Miles is interrupted. Still further in the conversation, Miles said: “Febuary wants to know if we can promise his protection. I think we can safely do it in a matter like this.” “Yes,” Mayor Woodward answered. Miles—He has the graft list, and knows whose on the list, who is to be protected, and who is not to be protected. It looks to me like we have the same things down here that they had in New York, only on a smaller scale, because Atlanta is a smaller town. Here the dictagraph did not record all that was said, owing to indistinct voices, according to Gentry, the stenographer, who was taking down the conversation. Colyar—He said he would give him a thousand dollars for the evidence. A little later on in the conversation, Miles spoke. Colyar—It is an affidavit from two people—both signed it—acknowledging threats, etc. graft and general corruption. Like you said a while ago. Miles—A place like the Walton Inn has never been closed. My information is that the woman who runs it is a sister-in-law of an official in the police department. A woman gave me that information and said that she was operating under protection. Woodward (evidently referring to reward asked for)—There will be no trouble about getting the money. Febuary here stated that he would see what he could get. Woodward—We are going to get up the money to pay for it. They’ll want to know what you have got and what you can prove. Then I can give him an answer. Woodward (later on in conversation)—I won’t do anything until it is substantiated. Miles—Yes, just forget it. You know you have never broken your word yet. Woodward—I hear they charge me with some meanness. Here the dictagraph was indistinct again, and the next words from Woodward were: Well, they have pretty good evidence on him. Woodward—Beavers. (Then later:) We want Beavers first, then Lanford. Miles is then quoted as saying that they would raise the money to pay for the evidence, go out into the county, examine the evidence, and then turn the money over. Woodward—We have got lawyers here that will get you out pretty quick. And I have the pardon power still. George M. Gentry, the stenographer in the other room at the end of the dictagraph wires, swore that the statements which he had taken down were true. A. S. Colyar and G. C. Febuary also swore that their conversation was true, and that Gentry had made a correct transcript of the same.